RIO DE JANEIRO, Oct 10 2014 (IPS) - Agricultural losses are no longer the most visible effect of the drought plaguing Brazil’s most developed region. Now the energy crisis and the threat of water shortages in the city of São Paulo are painful reminders of just how dependent Brazilians are on regular rainfall. Nine million of the 21 million inhabitants of Greater São Paulo are waiting for the completion of the upgrading of the Cantareira system, made up of six reservoirs linked by 48 km of tunnels and canals, which can no longer supply enough water. For the past four months, the water that has reached the taps of nine million residents of Brazil’s biggest city has come from the “dead” or inactive storage water in the Cantareira system – the water that cannot be drained from a reservoir by gravity and can only be pumped out. These supplies will last until Mar. 15, 2015, according to the state government. “If rainfall in the [upcoming southern hemisphere] summer is only average, we will have another complicated autumn; and if it rains less it will mean a collapse,” architect Marussia Whately, a water resource specialist with the non-governmental Socioenvironmental Institute (ISA), told Tierramérica. There is no possible replacement system, she said, because Cantareira supplies water to 45 percent of the metropolitan area, distributed by Sao Paulo’s state water utility Sabesp, while other water sources are also low due to drought and pollution. 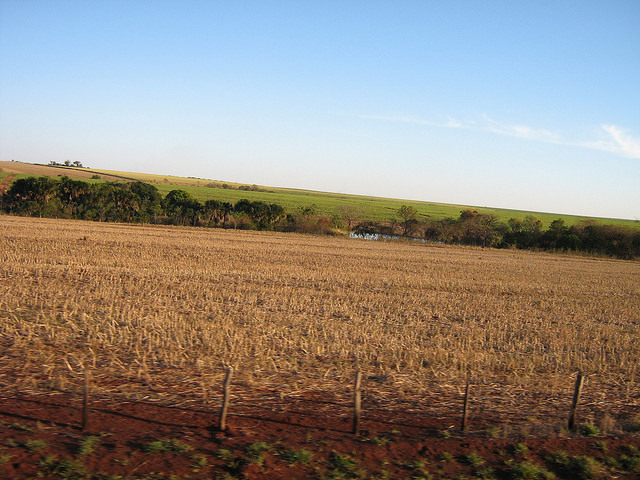 Whately said the intensification of extreme weather events, such as this year’s drought in southeast Brazil, preceded by two years of below normal rainfall, is one of the causes of the water crisis in the state. To that is added poor management, which has mainly sought to increase supply by tapping into distant sources that require infrastructure to transport water long distances, without adequately combating losses and waste, she said. But in her view, the main reason is “the lack of dialogue and social participation” regarding water supply. Droughts have become more frequent and intense this century. “The first alert came in 2001, when the system was reduced to 11 percent of capacity in August,” said journalist and activist Isabel Raposo, who has lived for 30 years in the Sierra da Cantareira, a forested mountain range north of the city with a huge state park. Water piped in from far away flows through the hills. 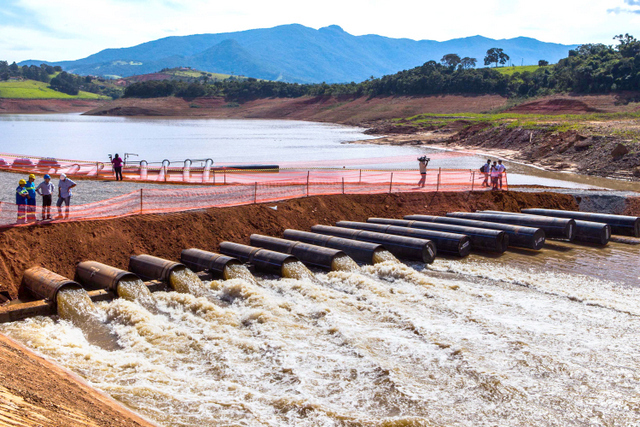 “The current crisis could have been avoided” if the large-scale reuse of water had been adopted after the crisis 13 years ago, Ivanildo Hespanhol, a professor of hydraulic engineering at the University of São Paulo, told Tierramérica. The five sewage treatment plants in the metropolitan region provide primary processing of 16,000 litres per second. But with further treatment the wastewater could be prepared for a wide range of uses, and could even be made potable, said the renowned expert. That could increase the total amount of water available in the city by one-quarter – enough to relieve the pressure on the water sources and make it possible to replenish them, even with lower than normal levels of rainfall. Industrial companies already use these techniques, reducing their water consumption by up to 80 percent and recuperating their investments in under two years, he said. Political will and a “realistic legal framework” are lacking, as well as a better understanding of the issue by the environmental authorities, he added. The emergency now requires more urgent measures, said Whately, such as reducing waste, which leads to losses of up to 30 percent according to different institutions; incentives for saving water; and better use of existing water resources. Given the “failure of the current model of water management,” with regulatory agencies lacking authority and basin committees that are ignored, ISA is trying to identify and mobilise concerned experts and institutions to discuss a diagnosis and solutions for the water crisis, she said. “More than 90 proposals for short-term measures have been presented,” she added. The 2001 drought led to a power shortage and blackouts that forced Brazilians to reduce electricity consumption for nine months starting in June of that year. The drop in the water level in rivers hurt the hydropower plants, which produced 90 percent of the electrical energy consumed in Brazil at the time. As a result, the energy sector was restructured, with an expansion of thermoelectricity, which is more costly and more polluting because it uses fossil fuels, but provides a measure of energy security. Hydropower’s share of the country’s installed capacity thus fell to 67 percent. For that reason, this year’s drought, even though it has been more severe in many basins, did not create an energy deficit, but drove up the price of electricity due to the full use of thermal power plants, generating insolvency problems for energy distributors, which were bailed out by the government, and exacerbating the difficulties suffered by the most energy-dependent industries. Even worse, because it affects millions of people, is the water supply problem in São Paulo and the surrounding areas. At least 30 cities have implemented mandatory water restrictions in the past few months. In Itu, a city of 160,000 located 100 km from São Paulo, local inhabitants have held demonstrations and occupied the city council building in September, to protest supply problems that were worse than what the local water company had announced. In São Paulo, people in the neighbourhoods supplied by the Cantareira system complain that water has been rationed, without any officially announced measures, for several months. Sabesp, the main water supplier throughout the state of São Paulo, admitted that it had lowered the water pressure in the pipes at night to prevent leaks and waste. 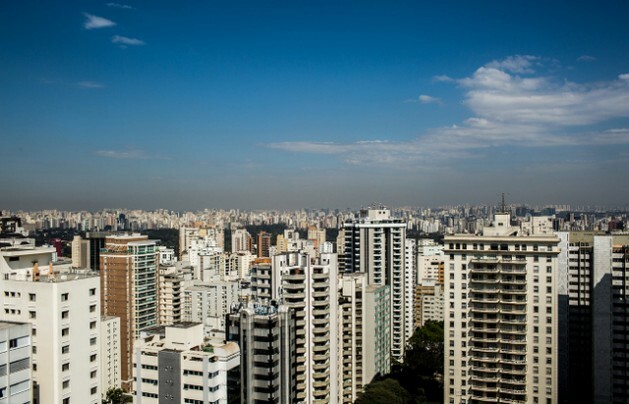 “We had no water for three or four days in August,” said economist Marcelo Costa Santos, who lives in an 18-story building in Alto Pinheiros, a quiet neighbourhood on the west side of São Paulo. He told Tierramérica that the low water pressure made it impossible to pump water up to the higher floors. And climate change threatens to aggravate the situation. A good part of the rain that falls in southeast Brazil comes from the Amazon rainforest, where deforestation has reduced humidity levels. It can be inferred that São Paulo is receiving less water from the Amazon, said Antonio Nobre with the National Institute for Space Research (INPE). Deforestation, the researcher told Tierramérica, also weakens the “flying rivers” – currents of air that carry water vapor resulting from evapotranspiration in the rainforest to the interior of Brazil. Rainfall in the centre and south of the country depends on the Amazon “water pump”. Another local phenomenon aggravates the situation. The “heat island” formed by the increase in urban temperatures in Greater São Paulo attracts rain away from water sources, said Raposo. Recent studies found that rainfall is generally more intense in the city of São Paulo than in the nearby mountains that feed the reservoirs of the Cantareira system. Twofold damage is the consequence: cities suffer constant flooding even though it is raining less than necessary, the activist said. If the planet could have one wish, it would probably be for we humans to die off. And at the rate we’re going, the planet will get its wish.